572 East Beach Blvd Unit 402 offers a 2 Bedroom loft which sleeps 8 and has an incredible direct Gulf view. Just steps away from sugar beaches and state park. Each bedroom has a queen size bed with hallway bunks and pullout couch sleeps 8 guests. Relax in pool and hot tub when not enjoying the beach and numerous near by activities. World famous Hang Out is less than 1 mile away along with amusement parks and many great restaurants. Condo is updated with a fully equipped kitchen, free wifi, cable, and phone. Something for everyone. Pier is just down the street along with boating, fishing , paddle boarding, dolphin cruises, zoo, shopping, and much more. Discount rate for 7 day stays. I've stayed at this property several times and when a rare two bedroom unit became available I jumped on it. Grand Resort is very well maintained with great amenities like sparking pool and hot tub. The 4th floor loft with high ceilings, spiral staircase and incredible beach gulf view from the private balcony provides a stylish yet family friendly getaway. Walk or drive to area restaurants and shops. Within feet of Beach and Gulf of Mexico. Directly across the street with deeded access . Loved the location of the condo! It was great having all the empty beach to the left of us. And the condo was so close to all the good restaurants. Myra made everything simple and easy too! Nice place to stay. Road to get across to the beach is very busy, so you have to be careful when crossing and also fairly noisy from all the traffic. Only real complaint was our next door neighbors had small children and they let them run up and down their spiral staircase pretty late at night and it was very loud in our room from them running up and down the steps. Otherwise nice condo to stay at. A pool was a plus !! !walking distance to may places and Next to State Park! 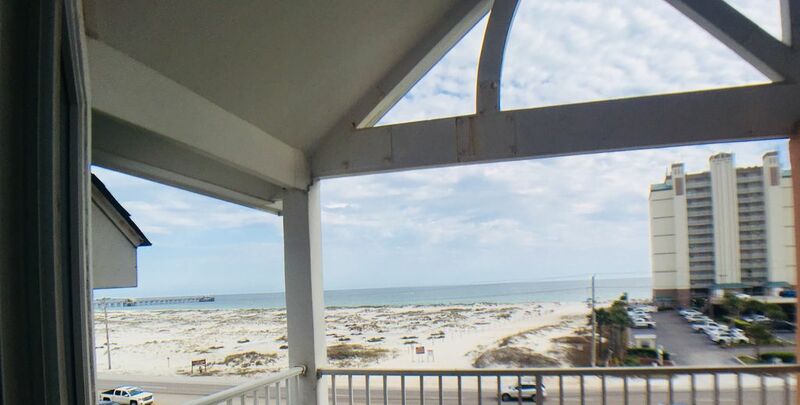 Very nice 2 bedroom/1-1/2 bath condo with covered verandah with view of beach/Gulf of Mexico across the street and about a block away. We met the owner, Myron Reynolds, who is very nice to work with. The complex where the condo is located has a pool and hot tub, and the facility is very well maintained. The location on East Hyw 182 is excellent and close to Hwy 59 which is a key location in Gulf Shores, AL. We hope to return in the future and highly recommend this for couples as well families. Great little place. Close to everything. My husband and I spent a long weekend unwinding and watching the waves. Just what we needed. We had to change our reservations and the owner accommodated. He responded almost immediately. Nice and clean and bright with ocean view and state park nearby. The condo was wonderfully clean and in a great location! Everything was perfect! The only complaint I have is that there isn’t a crosswalk for about a block even though the beach access is literally across the street. We have little kids so that was frustrating, but it doesn’t deter us from wanting to return. Great vacation rental!